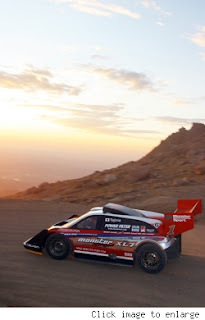 Monster Tajima in his Suzuki XL7 Hill Climb special set the new record at 10 minutes 1.408 seconds for unlimited class at Pikes peak beating Rod Millens 10 year old record.So close to that 9 minute barrier, maybe next year. Nice you got comment spam! He broke the record with some Falken ZIEX tires for truck with 22s? Wow, that's pretty impressive!